We’ve mentioned the Dow Jones Industrial Average (DJIA or Dow, as it is commonly known) before, a large cap index that tracks 30 blue chip stocks in the “industrial” sector. Recall that the index does not include any companies from the transportation or utilities sub-sectors, but includes a wide range of others that are traded on the New York Stock Exchange and the Nasdaq. While buying the individual stocks of the companies listed in the Dow index is quite possible, most investors prefer to invest in the DJIA in a more convenient and comprehensive way. Here, we’ll take a look at the common Exchange Traded Funds (ETFs) and Mutual Funds that track and/or invest in the Dow. This table lists two common, and two lesser known ways to invest in the Dow. In orange is the DJIA itself so that you can compare year-to-date (YTD) and 50-year performance returns. We’ll dissect each below. The DJIA is closely associated with the Dow Diamonds, an ETF that trades under the symbol DIA on the New York Stock Exchange. The Diamonds ETF may be the most straightforward way to invest in the Dow 30 stocks. This ETF is managed by State Street Global Advisors as part of their SPDR series, which also includes other ETFs that track other large cap indexes. I like the Dow Diamonds because it’s one way to own U.S. equities in a diversified manner. They’re a step up (to me) from owning individual stocks since they behave like stocks while still giving you the kind of diversification that’s offered by a mutual fund. You can buy the Dow Diamonds (which works the same way as a common stock) on a margin account. If you have not traded on a margin account before, you should consult with a stockbroker to make sure you understand the rules and responsibilities. If the price of the Dow Diamonds declines, for instance, you may need to deposit more money into your account. The SWTSX is a mutual fund available online at Schwab.com or through any Charles Schwab brokerage office which aims to track the Wilshire 5000 Composite Index (also known as The Dow Jones U.S. Total Stock Market Index). The Wilshire 5000 covers the universe of U.S. stocks with pricing data (public U.S. companies, in particular). While obviously broader than the Dow Diamonds, the Schwab fund follows similar trends and simply broadens the portfolio beyond the 30 blue chips of the DJIA. A big advantage of owning SWTSX is that there are no load and no transaction fees for this mutual fund. In most cases, you’ll only pay a 2% redemption fee so long as you invest at least $100. Then there’s the ProShares Ultra Dow30, an ETF that aims to hit 200% of the return of the DJIA index for a single day. Due to the compounding of daily returns, investors should monitor their ProShares Ultra holdings frequently because day-to-day prices can change, sometimes drastically. The ProShares Ultra is sometimes called 2x performance, because you can make your money go farther with fewer shares, without the use of margin. Now if you’re looking for even more leverage, you can consider the ProShare ETF that offers a 300% Dow leverage, aptly called 3x performance. Given that this is an ETF, the fees involved are kept in check. This ETF is also managed by ProFunds, but unlike its cousin Ultra, the UltraShort seeks a return of -200% of the return of the DJIA on any single day. The UltraShort is an inverse ETF that works by using short selling, futures contracts, and other investment techniques to perform the opposite of the index. So if the DJIA rises by 10%, the UltraShort hopes to decrease by 20%. So why would anyone want to own an ETF that hopes for negative returns? First, you can seek a profit when markets decline. Secondly, the UltraShort doesn’t require the fees and paperwork associated with a margin account. Finally, because its value rises in a declining market, the UltraShort can serve as a suitable hedge during a bear market. 1. If you don’t already have one, open a stock brokerage account or an IRA. 2. Figure out how much money you want to allocate to the fund. Remember that a diversified portfolio is typically better for long-term growth and stability. You may also want to allocate some of your portfolio to small companies, international stocks, or cash funds. 3. With the help of your broker, or by trading online, purchase the number of shares you’d like to have in the fund. You could consider setting up a dollar cost averaging or automatic investment program into your chosen fund or ETF, or decide to make a “one time only” purchase. This chart (courtesy of Yahoo! 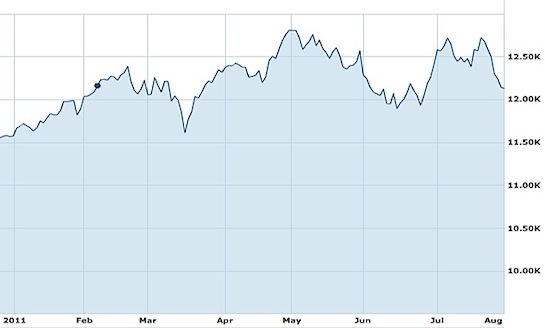 Finance) shows the one-year trend for the Dow for 2011. While the index has suffered a few setbacks during the year, the Dow has been on a fairly stable upswing since 2010. Do your research and keep trends like this in mind when deciding to invest in any of the funds we’ve discussed. By the way, not to confuse you further, but there are many other “Dow Jones Indexes” around, which represent various parts of the equity market. You can find out more about the different indexes here. Created August 19, 2007. Updated August 2, 2011. Copyright © 2011 The Digerati Life. All Rights Reserved. There are some good ideas here, especially now that we’re seeing troubled times ahead once again. My feelers are out whenever there’s a crisis, just because there’s usually an overreaction whenever the markets drop worldwide, the way they’re doing so right now! I am usually pretty excited about times like these (particularly in the past), but somehow, the fundamentals are a bit murkier now, don’t you think? Developed nations are mired in debt and the consensus is that these large economies are in much deeper pits that are going to be much harder to dig out of. The last crisis was bad enough… and it was followed by a very tepid recovery, so I’m more than a bit wary of what the future will hold at this point. Here are some fun facts I thought you’d appreciate about the Dow Jones: it was named after a fellow named Charles Dow, who would track and watch 12 stocks. To get the average, he added up the closing prices of each stock and divided by 12…pretty simple arithmetic. Today, there are 30 Dow stocks and though the principle is the same, there’s one key difference: you no longer divide the total of the closing costs by 30, thanks to stock splits, mergers, acquisitions and the like. The divisor changes based on the stocks that are swapped in and out of the index on any given day. The good news is that the divisor is actually published in the Wall Street Journal every day, to make it easier for us mere investing mortals.